At D23 this past Friday, The Muppets were out in full force for their ‘Magic of the Muppets’ panel. They made some fun announcements (new Pigs in Space shorts!! ), but they were mostly there to promote their latest TV project - a return to primetime television on ABC, currently slated to debut on September 22. 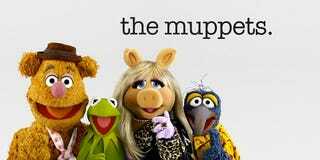 It’s going to be a show-within-a late show, starring Miss Piggy. Miss Piggy is currently separated from Kermit, and most media outlets have jumped on that story. There are also the usual editorials, ruminating and bemoaning over whether this is a good idea. On one hand, it is, without a doubt, a publicity stunt — one that has worked very well, and has raised the notoriety of the show. The hand wringing is what the producers wanted, and they got it. But on the other hand, I would argue that this is closer to what Jim Henson wanted all along — a more mature entertainment, delivered at adults, that didn’t pander exclusively to children. But these goals was complicated by the deal that Henson made with the Children’s Television Workshop to create Sesame Street. It roped Henson in — his creations were seen by an entire generation of children as kiddie clowns. Still, that didn’t prevent Henson from slipping in some decidedly more subversive humor amongst the learning — what word does begin with the letter ‘F,’ Kermit? There were several aborted attempts to get adult Muppets entertainment off the ground. Henson paired with Lorne Michaels to create Muppets sketches for SNL. This flopped — the SNL writers, rather than Henson’s people, wrote the scripts. There was also the release (and panning) of The Dark Crystal, which has since become a cult classic. The most recent small screen attempt was Muppets Tonight, but that only lasted from 1996-1998, and was essentially a continuation of The Muppet Show. So the majority of media has it all wrong. This ABC television show is interesting, not because adult Muppets are ‘new,’ but because this has been done, several times before. So alarmists can relax. The Piggy/Kermit separation and the more ‘adult’ tenor of the show, is consistent with what Henson always dreamed of —and fell short of — for his creations.